Dev Evolution: Meet Fernando from Yeeply project platform! Developing new software or an app is no small task. It takes a whole team of dedicated people working across different departments. How do you make sure you create value as a project platform startup that brings all these people together to work in sync? Our partner, Yeeply, shares a few challenges and how to overcome them. Yeeply is a platform bundling certified developers – focused on the development of webs and apps as well as additional marketing and design services. Our network includes on one side our developers, marketing specialists, and design experts. And on the other side, we work with startups, SMEs and big companies. Our platform simply brings these two parties (clients and professionals) together in a quick and easy way. Currently, we have over 150 certified teams spread over more than 40 countries worldwide, who carried out over 600 technical projects. We make sure that our developers, only receive projects that are truly matching their knowledge and experience. What challenges have you faced as a company? 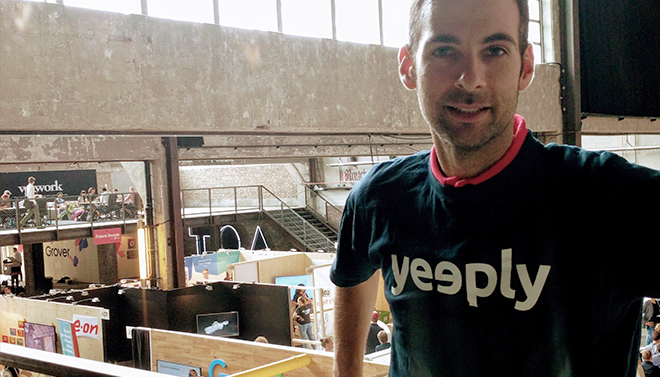 As a marketplace business, one of the main challenges we faced was to conceptualize Yeeply as a platform that provides value to two kinds of users – both clients and developers. Without highly qualitative development teams, clients have no incentive to use our project platform and to pursue a tech-project with us. And, without a quality list of clients, we cannot convince the developers to get on board either – the typical “chicken and egg problem”. In order to provide both sides with the service that they needed we noticed we had to focus on quality, trust, support, and the direct relation between saving time and costs. Secondly, as a startup, it wasn’t enough for Yeeply just to be profitable in the first place. We needed to be scalable. Finding a niche market and differentiating ourselves from our competitors was the first step – covering the demand for a customised platform in the sector of mobile applications, focusing on the quality and objectivity of our projects. Besides, technology moves at an incredible speed, and keeping up with the changes can be a challenge for startups. Facing rapid growth, one of our next challenges was to find and hire new talents with new profiles and experience to help tackle the startup’s growing needs. How do you make sure only the best professionals are included in your project platform? We created our own certification method in order to validate the quality of professionals that are included in our network – freelancers, agencies, development companies, and large technology enterprises. They all have to pass a verification process to prove their knowledge and experience before getting certified. After filtering and validating the applicants’ profiles we conduct an interview with them to verify their technical and professional skills. Previous projects, references, and language skills are evaluated. The last one depends on the markets they want to work for. In the next phase, we validate their references by contacting previous clients. At least one valid reference from a previous client is required to proceed with the process. Finally, the experts get officially certified after they completed one of our smaller projects to prove their skills and abilities. Only 1% of the certification requests are eventually accepted to the platform. We are looking for teams and professionals with technical skills and experience in the development of mobile applications, both native and hybrid, websites and mobile games. What are the reasons for developers to work with Yeeply? The possibility to communicate openly and transparently with the customer. What about the salaries and professional growth developers get out of the projects? As mentioned before, there are no fixed salaries for our professionals. We only check 5% of the established prices. Besides, Yeeply is free for our developers/professionals. Because of this, they are able to focus completely on creating high-quality developments for clients. By cooperating with us, they do not only gain technical experience in the implementation of full-stack projects, but also in customizing the development to client’s needs. As our certified developers are able to decide independently whether they want to accept or reject a project, they can define their expertise and reputation in specific fields further and grow their skills in the tech-area of their preference. With our technical support and guidance provided to back complex projects, our experts also trade their team-working-skills and networking. Partnering with us, they can benefit from the synergy effects of being part of a network as opposed to competing on the market alone. What are some of the best / favourite technologies devs work with and why? Our experts are specialized in native and hybrid mobile app development, such as Swift for iOS and Kotlin for Android. To cover the full Web-app / Mobile-app / Backend-CMS ecosystem, many of them expanded their field of expertise to Django/Python and React / React-native as well. For now, IoT mobile Apps, 3D applications, AR and VR are the most popular technologies, simply due to their increasing popularity and future potential in digitalisation. For the same reason, more and more devs are looking into potential Artificial intelligence (AI) and Blockchain applications for the mobile ecosystem. What would you advise developers looking for work and working in web or app development services, as an expert in the industry? In my opinion, the most important thing to do as a web or app developer is to take care of your personal branding. As teleworking is very common in this type of industry it’s significant to be present online. With this I mean being active on social networks, having a strong portfolio, and giving your opinions in forums for example. It could also help to create articles or videos about specific topics in order to show people your expertise. Sharing this type of content on your LinkedIn, for example, could help to encourage others to work with you. If you want to take it a step further, you could even try to ask tech blogs if you could write a guest post for them.